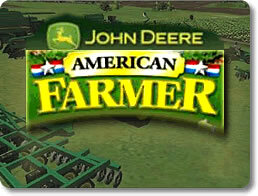 John Deere: American Farmer Game - Download and Play Free Version! 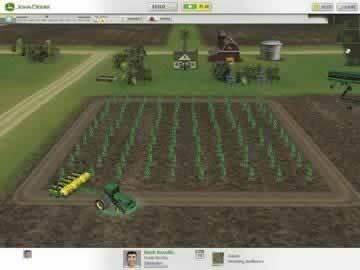 Create and Manage Your Own Successful Farm With Your Favorite John Deere Equipment! Ever wondered what it's like to live and work on a real farm? Here's your best chance to find out! Already live on a farm or grew up on one? Here's your opportunity to relive all the best that the farming life has to offer! True to the real agricultural industry in every way! John Deere: American Farmer isn't your run-of-the-mill farming simulation. Just like real farmers do, you face issues of market and price fluctuations, insects, droughts, soil quality, crop failures, the seasons, and so much more! Can you make the most money specializing in raising cows and corn, or should you diversify your farm with sunflowers, soybeans, and hogs? Invest in "hobby" products like honey, and sell them at roadside stands. There are so many routes to be taken, you'll hardly know where to start! Through individual scenarios, John Deere: American Farmer presents you with a variety of specific problems to explore. Raise and sell 10,000 pigs to complete "Hog-Wild." To beat "Fixer-Upper," repair a run-down farm and make it profitable again. In "Golden Tuesday," stockpile a certain amount of grain to strike it rich when the time comes and commodity prices spike! Play each scenario on any of three difficulty levels to fit your farming expertise. Seven other scenarios also await, but the farming fun doesn't stop there. Free play mode gives you no objectives at all and just lets you do whatever you want! Simple and fun enough for aspiring farmers of all ages! The game's interface is quick and easy to learn and use. You're presented with a bird's-eye overview of your farm, and you can zoom in on any part of it with a click of the mouse should problems arise. The basics of John Deere: American Farmer are so simple that kids can learn them in a short time, but the game also includes enough depth and complexity for even the most serious farming enthusiast! Of course, it wouldn't be a John Deere game without the finest quality agricultural machinery! John Deere: American Farmer lets you get behind the wheel of tractors, combines, planters, cultivators, and more, each with the familiar green and yellow John Deere paint job. Each machine is rendered in painstaking detail to be as true as possible to the real thing! From the comfort of your own home, experience a taste of the same pleasant life in the countryside farming families have lived for generations, with one difference: John Deere: American Farmer lets you mold that experience into whatever you want it to be! Use the built-in Map Editor to create your own unique scenarios!! 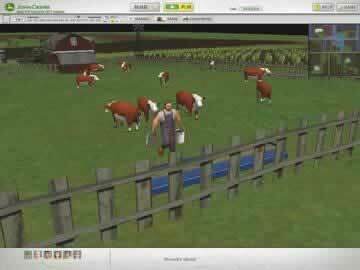 Player created video showing some of the game features like planting and harvesting.